(NaturalNews) A white powder that glues together small scrap pieces of beef, lamb, chicken and fish is sold by the kilo and is considered to be the meat industry's "dirty little secret." This is not breaking news, as the industry has been at it for quite some time, but just how many people need to know if they're greatly increasing their chances of consuming some E. coli with those "choice" filets? Just what is "meat glue"? Surely, you don't know if you're still eating it, and still feeling the health detriment. Hey, carnivores, would you mind if someone glued together some road kill with some pig's blood and seasoned it just right with some MSG? You think it's premium steak or a choice cut of filet. Some experts can't even tell the difference. It won't tear where the pieces are mended together, so you can't tell that it's not one piece. You can't distinguish whether it's one cut or a toxic collage of 20 cheap tidbits! Chefs use this trans-glue enzyme in a white powder form to mend the meat. You have to be careful in preparation not to breathe in the powder! 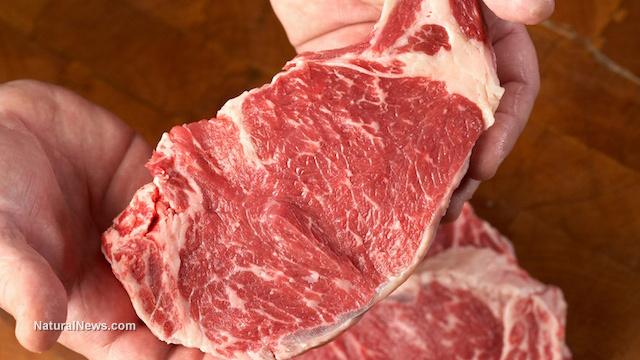 This is an industry-wide secret that butchers don't want you to know about. Major suppliers have been caught using this "special product known as meat glue" to stick together sub-par portions or "scraps" of meat to sell as prime cuts. In some parts of the world, there are no regulations on meat glue. It's often packaged in supermarkets and delis as "formed" or "reformed" meat. Big Surprise! Chefs in the grand 'ole U.S. need not worry. No regulations are coming down the pike any time soon; in fact, Obama and the sold-out USDA don't even regulate the toxic heavy metals in organic meat, so what would a little glue in conventional meat chunks do to hurt the humans? Beef glue -- it's what's for dinner! Here's the scariest part. The powder substance is actually made from an animal's blood clotting agent (swine usually) and leaves the problem of increased potential for bacteria gathered from multiple pieces. Roll it up in plastic wrap and refrigerated for about 1/2 a day and what have you got? Filet mignon. Abracadabra! It's been done in US banquet halls for decades and it's USDA-approved. Want some (blood-clotting agent) choice filet with that Alzheimer's disease, sir? Would you like your prime cut (that causes blood clots and strokes) cooked medium-rare or well-done, ma'am? Guess what -- if you don't cook the middle of that meat scrap clump well, you are not killing the bacteria likely in those portions, contaminating your entire digestive tract with the lingering bacteria. Besides the health risks and the unethical practice of it, using meat glue is just plain consumer deception. It's a jigsaw of sources from different animals. What if a beef eater doesn't eat pig? That's certainly not Kosher, by any means! And did those pigs and their blood live in concentration camps, otherwise known as CAFOs? Meat Glue and Pink Slime - What's Next? While some companies distance themselves from meat glue transglutaminase, the American Meat Institute publicly defends it, saying its depiction by consumer activists is unfair and that it's been nicknamed "meat glue" for the shock factor. What's really shocking is when you're invaded by organ cancer and the oncologists send you home to die. But it doesn't matter if the USDA or the "Meat-Glue-Safety Institute" says eating glue is safe, because we all learned in elementary school that eating glue gives you a horrible headache and stomachache -- plus, it tastes terrible. Use common sense. Ask questions. Investigate your own health. If you must eat meat, remember, don't eat cancer and it won't "eat" you!